React Hooks are currently available in the alpha release of react@16.7.0-alpha.2. Sweet, the first result takes us to “Destructuring assignment” where we can learn all about this feature. Ok, so basically it means that there are common patterns or ways to write code in a given language, so the language makes a syntax feature to make that pattern require less code or be more expressive. With this in mind, when I’m learning new syntax, I like to “de-sugar” the syntax to see what it would look like if we didn’t have that feature. Phew, that’s better. Okay, so what’s going on here? Babel’s taking our one line and rather than using the Array Pattern thing, it’s assigning the return value of useState to a variable called _useState. Then it’s treating _useState as an array and it assigns count to the first item in the array and setCount to the second one. Oooh, fancy, so if the first element of the array is undefined, then we’ll set count to 3 instead. Default values! Sweet. Note: most of the things above you would never need to do with useStatebecause we can always rely on useState returning an array of two elements! We’ll look at that more next. Ok, so what does useState actually do then? What is it really returning? It must be returning an array for us to be doing the array destructuring like this right? Cool, let’s check that out. One thing that’s interesting is that the implementation of useStateexists within react-dom rather than react. I know, that may be confusing because we import useState from the react package, but it actually just delegates to the current renderer (which is react-dom in our situation here). In fact, setState is the same way! It’s actually just a hook that’s using the useReducer hook! Okay, but what is that basicStateReducer thing, huh? I hope you found this one helpful! 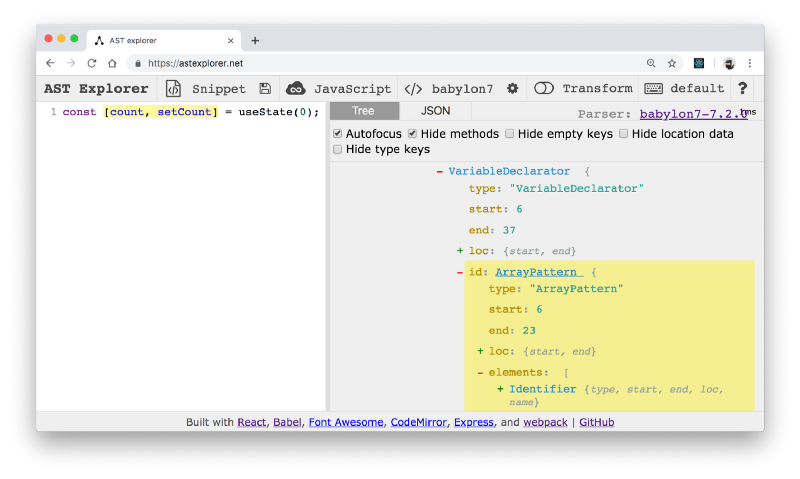 Even if you already are very familiar with the destructing syntax, the process of learning new a syntax that I show above has been helpful to me as recently as Friday when I was playing around with TypeScript. Seeing syntax that I’m not familiar with and learning new things is something that I’ll never get tired of in this industry! And learning the fundamentals behind these bits of syntax will make you more effective at using them. I also should mention that there are more things you can do with destructuring and if you’re interested there’s a section about destructuring in my ES6 workshop that’s available completely free on my YouTube channel. Good luck!